Tonight's show at Cardiff International Arena (December 13th) and tomorrows show at Glasgow SECC (December 14th) have unfortunately been postponed. Singer James is unable to perform due to a bad case of flu. Empty Souls will be the next single - released on December 13th. The next Single from 'Lifeblood' will be 'Empty Souls' and is due to be released on the 13th of December. 'The Holy Bible' re-release is due out on the 6th of December. This includes a bonus DVD of rare videoclips, a cd with the US remix of the album and some rare audio tracks. 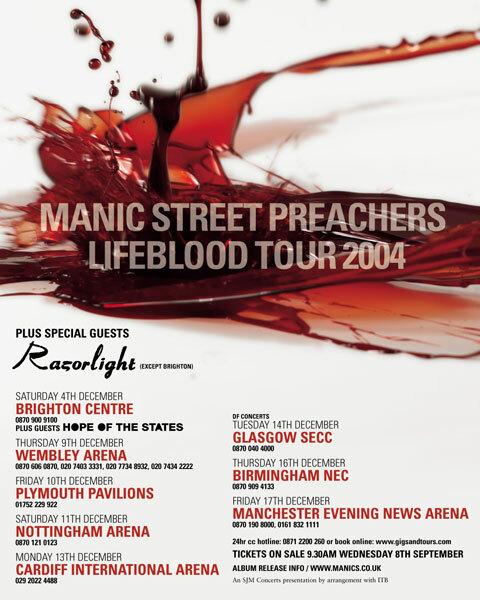 The Manic Street Preachers have just announced tour dates for December (again, they want their fans to freeze to death so they can retire!! ), they also release a new album, 'Life blood' on November the 1st, read more on this here. Support will come from Razorlight on all dates except Brighton where Hope of the States will support. Tickets are on sale from the 8th of September.